This curried peach, fresh ginger and cranberry chutney makes a wonderful accompaniment for roasted and grilled chicken, turkey, ham and pork. Combine juice, onion, red pepper, garlic and sweetened dried cranberries in medium saucepan. Bring to a boil over high heat. Reduce heat to medium. Add remaining ingredients. Cook for 12 to 15 minutes, stirring occasionally. 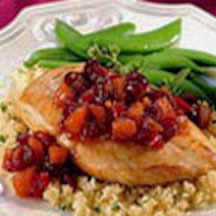 Recipe and photograph courtesy of Ocean Spray Cranberries, Inc.